Dubai, UAE, November 22, 2018: Balmain has such a deep understanding of women that it already knows exactly what will make the future Miss Switzerland tick, months before she has been crowned. 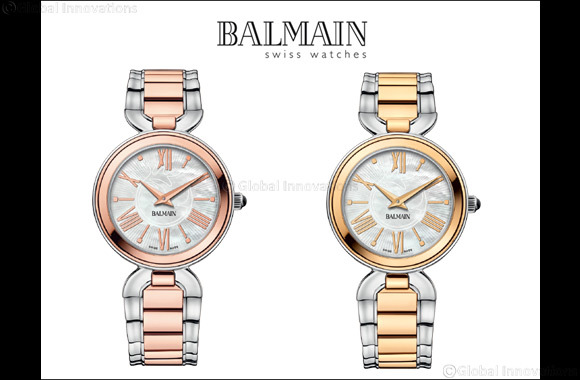 Since 2005, Balmain, preferred partner of the Miss Switzerland competition, has had the task of designing a timepiece committed to keeping the ultimate Swiss Miss perfectly on time and on trend. This year a Madrigal Lady II timepiece with 60 diamonds and arabesque dial decoration will have the role of honor. A refined combination of sophistication and modernity, the specially developed watch merges attention to detail with eye-catching looks. Obviously a tiara isn’t a pre-requisite for wearing one of these watches. The collection is available to all other deserving misses worldwide. The Madrigal Lady II family is music to the ears of modern women who enjoy celebrating their femininity in style. A tapered central attachment between case and bracelet is reminiscent of the curves of a subtle hourglass figure.. An array of monochrome and bi-colour metal bracelets team up with brown sunbrushed, silver sunbrushed with arabesques or shimmering mother of pearl dials. The broad range of looks echoes the brand’s origins in a famous Parisian fashion house as materials and shapes join forces to applaud aesthetics. The metal finishes available within the Madrigal Lady II collection are rose or yellow PVD or stainless steel. Reflecting the appealing mysterious side of the female psyche is minimalist dial detail consisting of delicate white mother-of-pearl dots to mark the hours and two compact shaped hands. This Balmain Collection priced at AED 1,950 and is available across Hour Choice stores in the UAE.